The spread of European education in alliance with the doctrine of Christianity had been an important impetus to missionary enterprise in India in the nineteenth century. Scottish Church College, established in 1830 as the General Assembly's Institution and given its present name in 1929 is an institution born out of one such impetus. The college founder, Rev. Alexander Duff, was the first missionary to India from the Church of Scotland. His idea was to set up an institution which linked western education with Christian mission and the eventual progress of the people -- years later the College is committed to the vision of its founding father and aims at academic excellence alongwith social awareness and character building. The College is the second oldest in North Calcutta and has produced numerous outstanding people, chief among them being Swami Vivekananda and Netaji Subhas Chandra Bose. The College has been awarded Grade A by the National Assessment and Accreditation Council (NAAC). The college also enjoys the status of College with Potential for Excellence, a quality rating by the University Grants Commission. 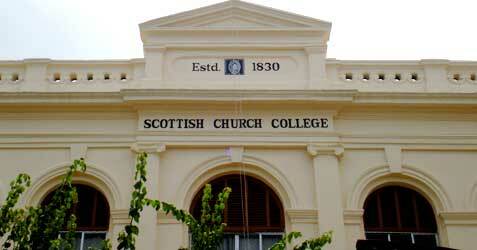 Media survey rates Scottish as one among the top fifty colleges in India. The College is now owned and administered by the Church of North India (CNI) through the diocese of Calcutta. It is affiliated to the University of Calcutta but enjoys autonomous status for its Faculty of Post Graduate Studies. We offer Honours course in 15 subjects in the under-graduate stream and post-graduate course in two subjects. The Department of Teacher Education of the college prepares women students for the Bachelor of Education degree. In keeping with the vision of its founder, the Scottish Church College encouraged academic excellence as well as promoting personality development, community service and the refinement of aesthetic sensibilities. Through the years a long line of illustrious personalities have been educated in these hallowed halls of learning. The splendorous architecture of the College including its magnificent prayer hall is eloquent testimony to its timeless heritage and the pioneering vision of its founding fathers.